Altitude range: 250 - 3540 metres above sea level. Habitat and ecology: Well drained stony places on flat-topped rocks and rock-crevices. 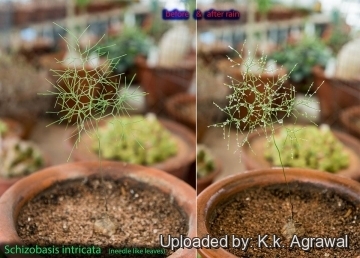 Description: Drimia intricata, commonly used to be know as Schizobasis intricata, is an odd bulbous geophyte plant with and a thick shock of intricately branched, wiry stems10-50 cm tall, which has taken over the function of photosynthesis from the leaves. It is related to Bowiea volubilis, which has a scrambling inflorescence, and also occurs in the same area. 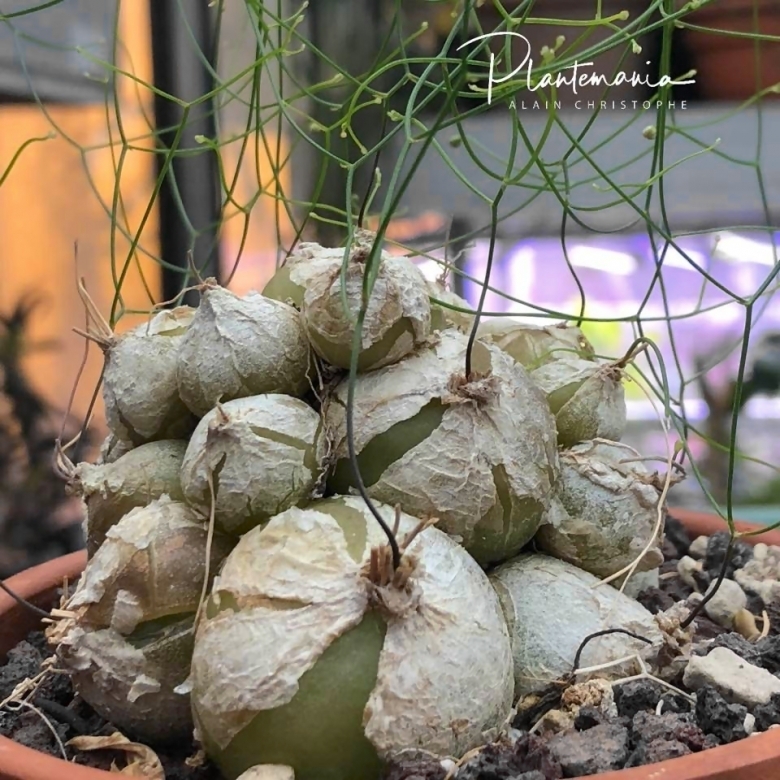 D. intricata, is sometimes cultivated, as a bulbous or as a succulent plant, with its bulbs partially exposed. It is a very fragile, tender and small plant. Bulbs: Mature bulb pale green to brownish, half-submerged, depressed-globose 2.5-5(-6) cm in diameter, tunics white or pink very loose. With time a plant may form a small dome of clustered bulbs. Leaves: 1-2 or more in the young plants only, terete, filiform, erect, 6-10 cm long, ephemeral, vanishing before the stems appear. The leaves in the adult plant, as in Bowiea, are restricted to the bulb scales. Inflorescence: 1 to 3, erect, to 50 cm long, much branched, branches ± at right-angles. Peduncle as long as the panicle, zigzag at the nodes, sometimes spirally twisted. Bracts 2 - 3 mm, spurred at the base, spurs up to 3 mm. Panicle 8-15 cm long and broad, very lax, corymbose, with zigzag rachises and slender, spreading, or ascending pedicels (1.2-)7-50 mm long, arcuate-ascending, articulated at the apex. Flowers: 3-merous. Perianth campanulate, ca. 2 mm long. Tepals, six, oblong, obtuse, joined at the base and then spreading out, white to pale yellow, with a distinct brown keel, spreading, to 4 mm. Stamens fused to the base of the tepal and slightly shorter than the tepal. Ovules about 6 in a cell. It is be self-fertile. Blooming season: It flowers very early in summer and the fruits are born easily, and the seeds can be harvested some weeks later. Individual flowers open at night. Fruits (capsules): Ellipsoid, up to 5 mm that split open at maturity. Seeds: Course-ground black, flattened, up to 2.5 mm. Cultivation and Propagation: Drimia intricata truly thrives on neglectand and proved to be considerably easier to propagate. It can be grown as cacti or succulents. Growt rate: The growth of the seedlings is very, very slow; this is not a plant for the impatient gardener. Soil: It likes well drained, organic soil (e.g. use a mixture for cactus + normal potting soil). It can be planted undergrounds, with a thin soil layer on it, or just leave it “on” the ground, it will root anyway, and the chances of getting rot are smaller this way rather than planted undergrounds (although it grows slower). Exposure: It can tolerate moderate shade, and a plant that has been growing in shade should be slowly hardened off before placing it in full sun as the plant will be severely scorched if moved too suddenly from shade into sun. Protect from heat in summer andkeep bulb shaded. Hardiness: Frost tender, frost free zones onlyand the temperature will range from 10 °C up to 15 °C. Pests and Diseases: Mealy bugs seem to be a problem, especially in older specimens that have formed a clump of bulbs. They hide in the residue of the old, dry, dead bulb scales. Propagation: Seeds or by detaching offsets when repotting , but can also be reproduced by dividing the bulbs. In fact any small (or large) fragment of a nice green bulb scale will sprout little baby bulbs if allowed to callus on the edges when simply placed on a bright windowsill. Just leave them until they have pulled all the nourishment they can from the "mother" bulb scale which will then dry up, then remove them and pot up.